Did you hear? The Eighties are back. Right outside my very front door, people too young to have experienced the decade the first time around are parading down the sidewalks in leggings and high-top sneakers, shoulder padded blazers, thick belts and inadvisable doses of fluorescent clothing, without a stitch of irony. You couldn’t pay me to join them; I aim only make myself live down each fashion disaster once in a lifetime, but in the kitchen? Oh yes, bring it on. Out of nowhere this summer (or perhaps out of the thin air of the 36th week of pregnancy), I began craving that 1980s dessert menu standard, chocolate mousse. And I didn’t mean, modernized chocolate mousse, the kind that’s been “rethought” and “renovated” into something delicious, but surely not mousse. I didn’t mean quickie chocolate mousse, which is usually little more than melted chocolate folded with whipped cream, if even that natural. And I sure as heck didn’t mean the chocolate pudding I tried to assuage my tastebuds with, which although really delicious, was no replacement for the decadence of mousse. No, I wanted the silky, taboo stuff, the kind of “foam” that was a 1980s restaurant standard: Raw eggs. Booze. Whipped cream. Butter. Teased hair. Okay fine, perhaps just the first four, but the first two alone would have been enough to send the Internet crashing through my computer, just to express horror at my raw egg and alcohol consumption while in physical custody of an unborn child. Needless to say, I decided to spare us that drama. But the baby is out — not just out, but amassing cheeks that will soon need their own zip code — and I am free once again to sully my system in any way I wish. And I chose the eggs. And the brandy. And the whipped cream and butter and I think you should too, at least once, probably twice. Frankly, it might be the least humiliating and most luscious way to entertain an 80s comeback, even if you — whoops! — forget to invite anyone else to the party. Yes, the eggs are raw. And I’ve been doing this long enough that I know someone is soon going to ask me if you can cook the eggs instead of using them raw or use yogurt instead of whipped cream or replace the eggs with flax seeds and water or skip the booze or reduce the butter, and so on, so let me just add this disclaimer: Yes, you may. You may make any changes that you see fit, any adjustments that will make this dish more enjoyable for you. You will, after all, be crafting this for you and not me. And it might be some kind of phenomenal when you’re done, something that exceeds your wildest expectations. But it will not be chocolate mousse. This is. And I think it is fantastic. Get out one large heatproof, two medium and one small mixing bowl and dust off your electric hand mixer. Set the large bowl over a saucepan of barely simmering water and melt the chocolate and butter in it, gently stirring it until smooth. Remove from heat. Alternately, you can melt them in your microwave, stirring thoroughly at 30 seconds and every 15 seconds thereafter until the mixture is smooth. 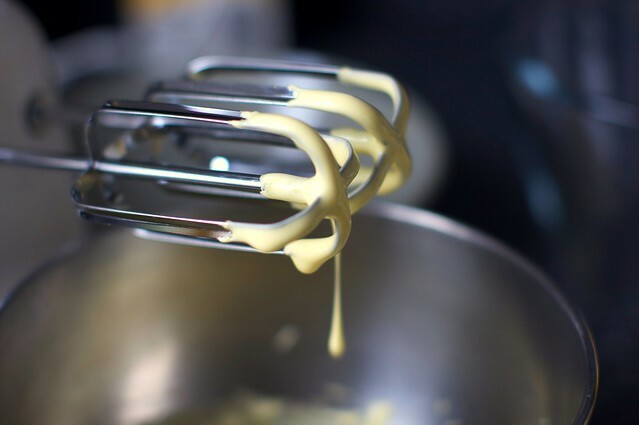 In the small bowl, beat yolks with your electric mixer until thick enough to form a ribbon that takes a few seconds to dissolve — this will take about two to four minutes to achieve. Whisk yolks into chocolate mixture along with Cognac, then cool to warm. In one of the medium bowls, beat the cream with cleaned beaters until it just holds stiff peaks. In the other medium bowl, beat the egg whites and salt with cleaned beaters until they just hold soft peaks. Fold the whipped cream and beaten whites into the chocolate mixture, gently but thoroughly. Transfer to 8 (4 ounce) ramekins or one large serving bowl, or go restaurant-style, serving it in stemmed glasses with white or dark chocolate shavings on top. Do ahead: Mousse can be chilled, its surface covered with parchment paper, up to 2 days, though I’ve never heard of it lasting that long with hungry people named Deb around. Let stand at room temperature at least 30 minutes before serving. OMG you just read my mind. I want to make this and no better place to find the recipe than Smitten Kitchen! Um, yeah. Raw eggs whatever, I’m eating this as soon as humanly possible. Yes, sniffle about a recipe from the second to last issue. I love chocolate mousse and always use raw eggs. Not sure about some of the other stuff, but if chocolate mousse means the 80s are back – so be it. Yes! I saw these pictures on Flickr and was waiting for this! This look amazing, and I really love your little white cups. Those are so great! Thanks for sharing, I will have to try this some time soon. Perfect. I want to dig in now. This is a favorite of my husbands and yes we ate a lot of it in the eighties. Another of your recipes that I will share with my food’s class. They are going to love it . It’s chocolate. Oh my. This looks… oh my. chocolate mousse is hands down best thing about the eighties. And the leggings to cover up a chocolate filled belly ain’t such a bad idea either! I wonder whether you will get fewer substitution questions on this post. You are more patient than I am to field so many questions (and we don’t even see all the email you get!) Deb. I like mousse. Both chocolate and L’Oreal. So, what’s the dessert of the 90s? Creme brulee? My 80’s eating was not nearly as good, but perhaps it’s not too late to repopulate my culinary memories. Foamy chocolate mousse is an ideal place to start. my aunt used to make a killer chocolate mousse for passover every year…she stopped making it around 1993 (i guess we were a little behind the times in my family) and i’ve wondered about it ever since. can’t wait to try this – and maybe it’s time to ask her for that recipe! Since I’ve eaten untold quantities of raw cookie dough and cake batter, a little raw egg in the mousse doesn’t faze me. Looks delish! There must be something in the air, because I’ve been glancing at chocolate mousse recipes for the last few weeks. These pictures are definitely motivation enough to try it! i’ve had a secret love for these raw eggs mousse n yes , the replacements will result in something else n not a perfect gooyi light mousse…i love it with some praline sprinkled over it..the only difference in the recipe i make is that the egg yolks are cooked on a double boiler to make a custard n whites are added as here….. The next step on removing rawness would be a Swiss meringue for the whites. It sticks with the spirit of the whipped up egg whites but heats up the egg. Dude, I’m totally rocking the old-school-blazer as of late. But no shoulderpads. Shoulderpads are just a travesty that should be banished from the pages of our history books. Also… I want this mousse for breakfast. This looks decadent! I love the disclaimer… I make an un-cooked banana split cake for my dad all the time with globs of raw eggs. I think he likes it better that way, sort of his old-man way of living on the wild side. This is just like my mom’s recipe. Her best variation (I highly recommend): sub 1/2 the chocolate with high-quality raspberry flavored chocolate, ghiradelli for example, stir in mashed raspberries to the finished mousse, and add a few on top too. Scrumptious! Luscious pictures of chocolate AND baby cheeks? just what I needed on this Monday, thank you! Sometimes you just have to go old school, like my friend Cara who makes a mousse just like this and then chills it in little demitasse cups like my mom used to do. I often use Chambord as my liquor of choice but you just talked me into brandy. Wow! No one has commented on the amazing cheeks! Let me be the first to drool over the baby before drooling over the chocolate. Actually, I’m not a huge fan of chocolate (I know! ), but this recipe will be good to have in my back pocket to pull out and amaze my friends at my next dinner party. The cheeks, combined with the hat-ears, are adorable. And this chocolate mousse looks ridiculously good. You know, some days you just need the raw eggs and the whipped cream and the butter….next time I have one of those days, I know where to turn! Oh, my, that looks amazing. I am thinking about making a dairy free mousse with avocados! I’m laughing at the disclaimer, and now craving chocolate mousse. Darn you, Deb, my hips are finally back to pre-baby size! Enjoy the ear-hats now, my Jacob is now 1 and seems to old for them already! Oh my god, that looks amazing. I, too, have been craving Chocolate Mousse for ages, but I’ve had a hard time finding an authentic recipe. Thank you so much!! Since I have neither cognac nor brandy, I’ll use Bailey’s instead. I get annoyed at the pearl-clutching anti-raw egg people. Eat some cookie dough every once in a while and live a little. Lordy. Love chocolate mousse. Just think, we did survive all those raw eggs (the banana split thing alone should have done in my family) and fashions. Too funny about people always changing things in a recipe. Your baby is just too cute. Going to need to get baby chapstick for those cheeks with winter and all those kisses he’ll amass. Amen on the raw eggs, Deb! And those people who have raw-egg phobia have probably eaten much worse with or without knowing it (esp. in restaurants). I’m bookmarking this recipe. YUM! Oh, and I saw the photo of your cute baby boy. TOO FREAKING CUTE!!! P.S. Is there a non-alcoholic substitution for the Cognac for non-drinkers out there? This looks positively sinful. Perfect! I haven’t made chocolate mousse for a long time, i ought to try your recipe, so greedy! My recipe skips the whipped cream (more French bistro, less Quilted Giraffe) and I’ve forgotten how easy it is! Thanks for reminding me. I fear the 80s really are coming back, and with a vengeance. Yesterday we took the kids to a real-live pumpkin patch out in the country, complete with hay bales, horse rides, piglet races, and a corn field maze. And – seriously – there was a woman walking around this dusty farm in a short, purple sweater dress. High, high heels. And… CABLE KNIT WHITE LEG WARMERS. I might have been able to forgive the fashion faux pas if she was passing out chocolate mousse samples, but sadly, no. I’ve been daydreaming about making chocolate mousse for weeks now. This looks perfect! If I remember correctly, Julia Child’s similar chocolate mousse, which I used to make a lot and which may now be back in fashion due to the movie, calls for Cointreau. It was delicious, so you might try that as a variant. There’s nothing like chocolate mousse! Sounds like a fab recipe! mmmmmmm. My mother had a similar recipe and i’ve been craving it, but butter, whipping cream, etc. don’t go with my WeightWatchers program except in little tiny amounts…so have been making do with 100 calorie premade lowfat chocolate pudding. Feh! Baby Jacob continues to astound with the absolute edibleness of his cheeks! MMMmmmmmm…… it sure is the simple things in life. Perfect comfort food. good sweet saints in heaven. this may be the perfect thing to eat as they daylight dwindles (the 5:30 darkness never ceases to bum me out), and I need something to make it all better. Only pregnant for another month…only pregnant for another month. Deb, have you been sent to test me??? May I say how much I admire not only your food writing, but your grace in the face of the “OH MY GOD YOU’RE PREGNANT HOW CAN YOU EAT X FOOD?” crowd? Mmmm. This is not helping my mid-afternoon sweets craving one bit. Recipes from “Three years ago…” For serious? Congratulations on your longevity (and your ability to refrain from making a serious ragu out of those cheeks!). Two things about this recipe: either use pasteurized eggs, or wash them in very hot water before cracking them. Salmonella is on the outside of eggs, the stuff you want raw is on the inside. Then stop worrying about the raw eggs. It’s much easier if you beat the eggs and whip the cream before you melt the chocolate. If the chocolate solidifies, you’re doomed, because I don’t think you can get the chocolate to melt again without cooking the egg yolks (at least, with the microwave, and the double-boiler arrangement is difficult). There’s no need to do the eggs and cream at the last minute, while the chocolate has to be maintained once it’s melted. My one mousse failure has been due to the chocolate solidifying and failing to coat the eggs and cream. Also note that you can use higher cacao percentage chocolate coming in if you put in sugar; 60% cacao chocolate is 40% sugar, and sugar is easy to come by. The only problem with 99% is that, if you first melt the chocolate and then mix it with the sugar, yolks, et al, the bowl where you melted it is too bitter to lick. Which brings me to the thing I haven’t figured out: how do you avoid generating enough dishes to lick that you’re not ready to eat chocolate mousse again before other people have eaten it all? I like your blog very much. Thanks so much for sharing, I didn’t even know what real chocolate mousse was, but I can tell you I’ll be trying it and soon! I honestly don’t know of a better way to relive the 80’s, teased hair and neon just don’t work for me like they did when I was younger. Hmm, I have seen the leggings and the side ponytails, but shoulder padded blazers? Egads! Oh, yeah..this was an 80’s fave. Lot’s of riffs for this too. My SIL used to line a springform pan with lady fingers, curved ends up and sprinkled with brandy, the center filled with the mousse (the mousse might have been reinforced with gelatine though) and covered with huge chocolate curls. It was called Chocolate Coronet. I think it was in one of the gourmet food mags. It was really good, too. It figures the 80’s hits and misses are coming back..this is the decade of 20yr high school reunions for the 80’s. That’s what starts the phenom as the graduates get nostalgic…er, at least it seemed so for the 60’s 20 years later! Yeek Talk about old school..lol!! The only part of the 80s I want to relive is the music (I’m totally a hair-band kinda girl) and perhaps this amazing mousse. Book club’s gonna LOVE this. What a coincidence – my 11yo daughter made this just a week ago. Without booze, though – she doesn’t like the taste, and the chocolate was so good it was enough to make the mousse taste like heaven. Anyway, if I would make it myself, I would use Bailey’s. I was born in the 80s, so I didn’t know chocolate mousse was a Thing back then. My mom has a recipe for chocolate mousse she clipped out of the newspaper in the 1960s. It’s very similar, with the raw eggs and cream (no butter or Cognac), but the texture is lighter and fluffier than yours. All of her children request this for our birthday meals, and there are 5 of us, so she’s constantly making this. In 2 weeks it’ll be my turn to enjoy it for my birthday! I made rich chocolate raspberry mousse this summer (the filling for Chocolate Wedlock from the Death by Chocolate cookbook). Something like 18 egg whites died for me to make enough mousse to cover the block. Hrm. This is more wallet friendly, so I might have to make this next time I get the dreaded desire to smother myself in chocolate mousse. Way to bring up the death of Gourmet and make me sad. That looks fantastic though. I love Jacob’s adorable hat…the ears are too cute! This looks like a great, back-to-basics recipe…perfect chocolate mousse! I just made pumpkin mousse! And I used raw eggs and brandy (recipe called for rum but brandy is much better). At least I’m not alone in my sinful ways. I don’t think i’ve ever had mousse that didn’t come out of an instant box. But then I was in elementary school in the 80s (don’t tell my husband, oh he of the class of 88). I think it’s time that I introduce myself to this dessert! Thanks for sharing! I absolutely love this post! It’s funny that you relate chocolate mousse to the eighties (I was only born a few months away from the nineties–eek!) because I’m studying in Denmark for a semester and it seems that chocolate mousse is the dessert at every restaurant meal I’ve had throughout Europe. So although I cannot have the kitchen ability nor the money to afford to eat anything but chicken and pasta, I have been reading your blog on and off for a few years and have been able to catch every post since August which is great, BUT it’s also terrible since I do not have the capacity to cook up any of these recipes. I have created a bookmark full of recipes from your site that I have come across that I will surely whip up once I am back in the states in December. Keep them coming! P.S. my parents still tease me for having enormously fat cheeks when I was young, good to know I’m not the only one! i made julia child’s version a few months ago and i think it sounds almost the same as this. real mousse- was more than what i’ve hoped for strong but delicate. i agree with you, Deb, that making the real thing is worth it, especially when you plan to put in the work. My mom made a mousse that is very similar to yours, similar enough that I would put money down that yours is fantastic. It certainly looks it! Why are Americans so paranoid about raw eggs? What else would you make mousse from? While I don’t remember the 80’s having been born during the very end of them, I do think this chocolate mousse will be added to the menu for my 80’s movie marathon. It just seems like the right thing to do. Wow I haven’t made chocolate mousse in forever — insanely delicious and, like most desserts, best enjoyed when you mentally block out the nutritional content. I thought I heard somewhere that the salmonella in some of the food in the US is caused by our industrial approach to agriculture? I forget the exact connection. Anyway, this recipe looks good and I will definitely try it. Your little guy is getting cuter by the day. I loved the pics with the Yankee hat! And it’s great that in honor of the 80s you also used a hand mixer. Love that photo. I’m a sucker for the 80s thick belts and some accents of its colour, but I’ve got to make it up somehow since I missed the 80s the first time around =D. This mousse looks perfect and an awesome way to reminisce! note to self: do not read smittenkitchen while on a cleansing fast! Oh gosh, I made something quite like this in the 80’s. You used Kalhua and poured it over into a chocolate cookie crust. I was so bummed when I lost that recipe in a move.I’ll be trying this! i never knew mousse was made was booze…makes it much more appealing! Hooray for raw eggs and butter and booze and chocolate! This was absolutely my family’s “nice” dessert for the Jewish holidays in the ’80’s. I was in charge of making the mousse. Very similar recipe except we used regular old Nestle’s chocolate chips, no butter (to keep it pareve, so the chocolate chips were melted by a boiling water/sugar combo) and some Israeli liqueur instead of brandy. Haven’t made it in years, but thanks for the reminder! This post was just too funny. I was born at the very start of this decade of regrettable fashion (hello, stirrup pants and shoulder pads! ), and don’t miss it a bit, but your mousse actually made me a bit nostalgic. Sometimes, simple and sinful is the way to go. I am old enough to clearly recall making this in the early 80s. Possibly even the very late 70s. And I so totally loved it back then. I am basically too scared to make it now for fear of unleashing the monster within and eating the whole lot. But yeah, it is seriously good. I’m gonna have to give mousse a whirl again. I wrote it off when it was reinvented. I’ve been reliving chocolate mousse thanks to Mama Mexico’s prix fixe lunch through deliveryweek.com. They do it with Kahlua and eating just a spoonful at a time (they’re so generous with the portions that I can’t eat dessert immediately after the appetizer and entree) makes my entire afternoon better. that is one 80’s fad I’d bring back in a heartbeat – chocolate mouse… so decadent and creamy! I actually saw legwarmers at Bed, Bath & Beyond the other day… almost had to run screaming from the store! This is exactly the recipe I needed after a day like today:) Thanks so much! Dude, I just made Alice Medrich’s dairy-free mousse, and it was awesome. I know it sounds like a lame attempt at cutting calories, but it actually makes the chocolate flavor more pronounced and is just as decadent as the whipped cream version. Get out your Valrhona and give it a shot! I think it’s called Albert’s Mousse and I’m sure you can find it online. Just the other day I was thinking, why doesn’t anyone ever eat chocolate mousse anymore? I love it. It’s so much better than pudding. My dad used to make it for us when we were little, I think from some sort of mix. I thought it was “moose”, which made a whole lot more sense than “mousse” to me when I was 7. I’m going to have to try the real deal though. I love this post! You kill me, and that mousse looks heavenly. OK, I’m right there with you on the clothing. It was atrocious then and it still is. I can’t help but laugh when I see guys walking around in all serious-ness in purple Eddie Murphy “Raw” leather jackets and matching sneakers. WTF? But chocolate mousse was (is?) out of style?!?!? Never has been, or will be, in my book! I make it myself at least once a year (gonna have to try adding some cognac next time, since booze makes everything better), and I look forward to my annual Fire Dept. banquet that always has a HUGE vat of insanely rich, old school dark chocolate mousse up on the dessert buffet. I do some serious damage to it. I just made this and am eating it as we speak…amazing! Ah, thank you cows and chickens…I could never be a vegan. I love your photos. They make every last drop of that gorgeous mousse lift off my sad, dirty computer screen and into my mouth! ps. the teenagers where I live also have the sulky, hair-in-the-face look in addition to their peg-legged pants and day-glo shoes. Mmm delicious. 80s scmaties, how can something this good ever be out of fashion? Okay, so aside from this looking phenomenally good (beautiful, sumptuous, decadent photography, by the way), I have a question from a non-American part of the world. What’s with all the raw egg hate? Did Australia miss the episode of House (or, more likely, Oprah) where raw eggs were declared The Root Of All Evil? Because, for real, nobody out here has any idea why there is all this staunch anti-egg-ism. given the vast quantities of raw cookie dough I’ve consumed over the years, I’ve developed a possibly unwise faith in my own immune system. at any rate, this looks fantastic! I’ll give it a try soon. This recipe sounds great–reminds me of the mousse my friend and I made for our high school French class (our teacher was horrified by the raw eggs, but it was authentic at least!) The reason I had to post, though, is your mention of your son’s cheeks! My daughter was born on July 12, and perfect strangers come up to us to comment on her chubby cheeks. Hilarious, and oh so adorable! I love your site! Salmonella is found both on the inside and outside of the eggs. Salmonella can be on the inside of the egg because it’s found in the reproductive systems of hens. However, you could use pasteurized eggs to avoid the risk (as you suggested). Salmonella can be very risky for someone who has a weak/developing/compromised immune system. You know I’ve always made mousse using sugar cooked whites or yolks mainly because i’m terrified of eating raw eggs. I just can’t bring myself to embrace the rawness. This is due to an intensive 3 month university course on food borne illnesses. However I love the throwback to the 80s and enjoyed every bit of this post. It’s already been a year since the pink lady?! I remember making it for my friend’s birthday last year…it’s been too long. And by the way, I am queen when it comes to substitutions. I don’t ask anyone about it (aren’t you glad) but I substitute like crazy and it all still turns out fine. Except for that batch of vegan brownies when I was 9 or something, where it called for prune baby food and I decided…to just leave it out. And leave the margarine out. And half the other stuff out. Needless to say, I’m careful now! I guess I’ve been reliving the 80s because I too recently made the real chocolate mousse, raw eggs and all. The recipe I used had a little bit of creme fraiche and fresh brewed strong coffee mixed in with the mousse and it was delish. I can’t wait to try yours and compare. On a funnier note, my mom had me try one of her old dresses that I pray was from the 80s, a cocktail dress with shoulder pads, man I felt like Julia Roberts from an 80s flick, “Mystic Pizza” for example. Shoulder pads should be banned forever! Oh man, I love love love the taste of chocolate mousse. Unfortunately, I have to steer clear of it as much as I can since I am lactose intolerant. 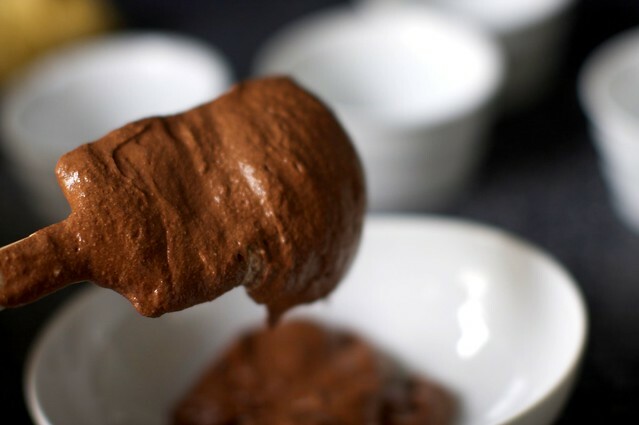 For all those fellow lactards, this is a great recipe for Light Airy Chocolate Mousse that uses just a little butter and no cream and you will never believe it from the taste and texture. Can’t wait to try this recipe, love so many of your recipes! Please do tell us where those cute cups came from!!! I want a dozen! Wonderful. I used to buy the boxed Mousse and make it, and it was good. Can’t wait to try the real thing. There is no substitute for this ravishing indulgence. I remember making this back when I used to keep my eggs on the counter in a little wire chicken shaped basket! I went 80s dancing this weekend, and I think there is no better music to dance to. That being said, I do tweak my mousse – to make it lighter, and milk/cream/butter-free for my lactose-intolerant loved ones. FUNNY! I made chocolate mousse for the first time last Saturday! (I used Julia Child’s recipe because… can you really go wrong with that? http://www.davidlebovitz.com/archives/2008/05/perfect_chocola.html) I live in Chile where chocolate mousse is still all the rage and I wanted to take it to a dinner party. Yes, I used stem glasses, whipped cream, and chocolate shavings. My kitchen was a disaster by the time it was done, but it was well loved by everyone. Even a four year old with very daring parents that decided it was ok for him to consume chocolate, coffee, raw eggs, and brandy after 11pm. We all survived! Just wanted to respond to Daniel’s post: if you’re concerned about salmonella, you should NOT wash the eggs in very hot water, because hot water breaks down the protective coating on the outside of the eggs and causes bacteria to penetrate through to the edible portion. The best way to avoid salmonella, and other food-borne bacteria, is to buy as fresh as possible, direct from the farmer. This looks fantastic. I have a chocolate not-mousse recipe that I use a lot, which also includes raw eggs (it’s made in a blender, and tastes of coffee and chocolate). It’s fantastic, and fantastically easy, but looking at this, I might just want to branch out into something a little more challenging. Fantastic. I’m so excited you posted this. It looks just like the kind of mousse my girlfriend loves, and her birthday is coming up. We recently had a mousse with salted cream in Brooklyn that she is in love with. And seriously, what is it with the ’80s? My mom called me the other day to tell me she was going to start wearing her shoulder pads again. Shocking. Can I substitute flax seeds for the eggs? This looks awesome. By the way, I was born in the early eighties so this is also my second time reliving the fashion. I probably came out of the womb with my hair crimped, and I currently adore my tights and legwarmers. My roots, you know? Yummy! That looks so good. What is up with all of the 80’s gear, right? Amazing. I have no issues with using raw eggs … BUT am in the same boat as u used to be a few months ago .. i.e. preggers. So will just just have to postpone concocting this amazing mousse till later (along with my cravings for sushi, blue cheese etc.) *sigh*. Salmonella is on the INSIDE of eggs, not just the outside. If you’re in a high risk category (children under 10, folks over 50, pregnant or have a suppressed immune system) use pasteurized shell eggs, like Davidson’s Safest Choice. My mom made a similar french silk pie that someone noted above with a similar version of that mousse-but there were 6 eggs in her mousse and the crust was made with crushed oreo cookies. It’s absolutely to die for. I’m going to have to make that this weekend now. Oh well-the diet can wait! before you put the egg yolks in – otherwise you’ll cook them. and then put the rest on top of it, and them freeze the whole thing. It’s also great with a layer whipped cream on top. PS: the disclaimer is GREAT! Oh good gracious lord help me that BABY. Such a perfect little punkin. I agree with whomever used the word “sumptuous” to describe the mousse photos; I’m not a fan of chocolate, but I’d throw down on some of that mousse, just from seeing the pics. I knew the 80’s were threatening, but I’m sad to hear that they’ve made full-on landfall. :( Some body types just don’t do well with the era… no mom looks good in 80’s garb. I don’t have the 36th week excuse, but I too have been oddly craving the mousse. As a child, it was the sophisticated treat (with the Shirley Temple) as an adult …well, we shall see. The 80’s freaked me out the first time around! I’ve shown my little sister, who is 17, the giant earrings full of neon glowing beads that I used to wear. She shuddered, then crossed her legs of striped colored tights and said “We’re not as bad as THAT this time around.” Oh, my darling lil’ sis, just the fact that there IS a “this time around” is terrifying! and she’s got the tights to prove it! haha! Now, the mousse…. probably the one saving grace I can handle from that decade. I more than likely will be trying this soon. Someone may have already said this, but the raw eggs will be cooked, (at least slightly) by the mixing in with hot chocolate. Sounds awesome, though! OH. Love chocolate mousse. My mom used to make it all the time when we were kids! My mom made something like this eons ago and only made it once. Probably because it took too many pans, but I digress. It was the best thing ever and the recipe has been unearthed right here on your blog. Thanks, I can now recreate the memory! Uh, Marla? Maybe you didn’t have a microwave in the early ’80s, but they did exist. I was married in 1983 and received a GE one as a wedding gift from my mom-in-law, who’d had one years before that. Same recipe I used but mine had espresso in it instead of cognac – hmm, may have to make both and compare. The coffee version is really good too though. So great! I made this exact recipe on Sunday night! As a member of the generation you see roaming around the streets in shoulder pads and cinch belts and neon and hairspray and leggings and…wow the list of bad fashion choices goes on and on (and I assure you, some of us are fully aware of the irony), I’d never had a “classic” chocolate mousse before. But I made this for my mom today and she claims it’s exactly like her mom used to make when she would come home from college :) Thanks for helping spawn a (very rare) mother-daughter bonding moment!! Now this is the kind of 80s revival I’ve been waiting for! I need to make this very, very soon. oh and ps, i swore i would never never never again wear leggings. i made it until last winter. Now I know what to put in my new remekins that have been waiting to be filled! And the baby… so so very cute. Ramekins — For those of you who have asked, they’re from Crate and Barrel. I was in Paris last winter and went to lunch at a cafe. Chocolate mousse was on the dessert menu. They brought an enormous mixing bowl filled with chocolate mousse, a spoon, and an empty dessert-size bowl. It was serve yourself, all you want. They’d bring the bowl around to the different tables as needed. They actually brought it round to me twice — amazing. And delicious, too. Okay, this recipe is officially an act of cruelty perpetuated against those of us who are STILL pregnant. LOL! Here’s hoping April comes quickly. I just can’t worry about raw eggs when it’s mixed with chocolate! Sounds delicious. There is seriously nothing better than a good chocolate mousse. I’m pretty sure I can taste this just from the photos! How can you mention those chubby cheeks and not include a picture of them? Chocolate mouse was always my fave dessert growing up. Funny, but I don’t think I have EVER made it. This looks tempting. I’m bookmarking and will put it on my list of recipes to try. thanks! Hope all is well with your darling little baby. My uncle made this every year for his wife on valentine’s day. He made it for all of us last year. Little did we know it would be his last valentine’s day. But, we have the memories, the recipe :), and the pictures. Okay where can I get some chocolate mousse within four blocks of my office RIGHT NOW!? Thanks so much for the mousse, but especially for the disclaimer! I say, get out there and do your thing! Experiment! Discover! Maybe fail once in a while, but really, what have you lost? That’s a pretty cheap education. I recently substituted some vanilla yogurt for the sour cream in one of your cakes, because (duh) I didn’t have any sour cream. It was delicious. No one noticed. I did not get arrested by the cooking police. And so far, no lightning has struck me. Just rent yourselves some common sense and don’t be afraid to use it! If making that awesome mousse means the ’80s are back, then bring on the Aqua-net. That looks incredible! If i weren’t living in a college dorm i’d go make this RIGHT NOW. From someone who is still 32 weeks pregnant? This is really, really, really mean. I have a leftover cup of heavy whipping cream. I know what I’m doing with it this weekend! OH if this tastes anything like the mousse chocolat in Paris, I don’t care how many raw eggs , or anything else for that matter are in there. Looks DIVINE. There is nothing wrong with a little mousse. I’ve been feeling guilty over a love of white chocolate lately- I like the high quality, real coco butter goodness, but I know that I am supposed to be sort of ashamed about this 80’s style food! I was born in the early 80’s. My friendships were unified by chocolate mousse that was served at this tiny restaurant, Basilica. It was the only place that I know of that has made this dessert the correct way, and they changed the recipe the last time I was there. I haven’t been back there since. If not for chocolate mousse, when else can one share an orgasmic experience with a friend in a completely indiscriminate way? I shall try your recipe, perhaps it is THE one. Thank you! Honestly, the rant about making substitutions was hysterical! Can you please interject that into more recipes. I love a good substitution, but fat and salt and eggs are delicious. When will people learn? Thanks for making me and my husband laugh out loud. It’s food people…shocker it is supposed to be enjoyed!! Time to use real cream, dark chocolate and eggs! This was so decadent and delicious. Thanks for your substitution rant …. people need to get over it and realize whole foods trump any substitution they could dream up. I love your little white ramekins!!! Where did you get them? oops just read above answer to that question. sorry =) i love crate and barrel! This looks heart stopping (in every sense), but so, SO worth it. Wow. Anyone wanting a pared down no-recipe version, try this: 1 egg + 1 oz choc per person. That’s it, but make it GOOD chocolate. Separate eggs, melt choc, whip whites, mix yolks with choc, fold in whites, refrigerate. Enjoy. Love the Mousse and all things chocolate. Grew up with chickens in the backyard since I was 3 and have had raw eggs, in things and ala carte for many years. But on to the really important stuff- So- when do we get to see the J man’s pic in the ABOUT section- he is, after all, going to be a major contributor to LOTS of your future recipes and other endeavors. I just tried making the mousse last night and it truly is heavenly!! One thing I did find was that it was easier to combine all the ingredients when I had whipped the egg whites and whipping cream first, then whipped the egg yolks after the chocolate had melted. I am stoked to serve it tonight, and yes, we had no option of restraint last night in “tasting” it! AMAZING! Hi there.. im totallly in love with your site. :) I could find many of my favorite recipes :) Mousse is one of them. Is there any substitute for the brandy/liqueur? We are non alcoholics so i would love to try this with a substitute. :) thnx in advance. You know…the alcohol just cooks off and the eggs get a little cooked too since its still warm :) Or at least that’s what I would have told myself when I was pregnant. The mousse I made during my last pregnancy didn’t include alcohol, so I was OK there, and we just won’t talk about those egg OK? I shall try this one as soon as I get to the grocery store as I am (gasp) out of butter. 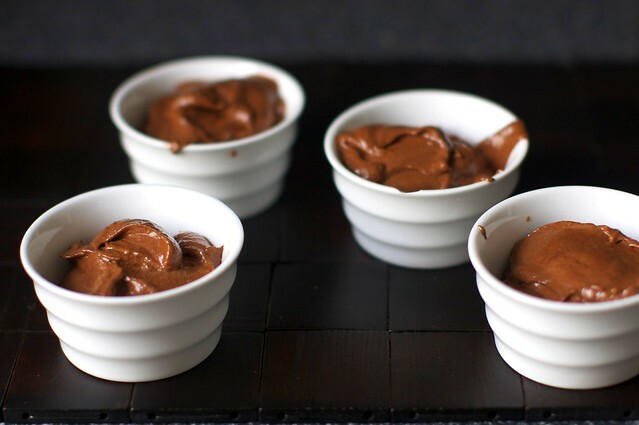 I LOVE mousse and have yet to try a perfect recipe, but you have never steered me wrong yet. The mousse looks absolutely delicious, but what really caught my attention was the little white, porcelain bowls. They’re fantastic. Who made them ??? Mmm, this looks so decadent. Thanks for another great recipe! so decadent, i want to eat my computer screen. but i’m pretty sure that won’t taste the same. My greatest worry about when we have kids is not eating raw/runny eggs while pregnant. I eat two poached eggs for breakfast almost every morning and fear the day that I cannot. I should probably go make this recipe now while I can still enjoy it! I must make this! My husband has been asking me to make “old fashioned” mousse, but I couldn’t find a good recipe. Thank you, thank you! Oh my goodness this looks to die for…awesome recipe!!! I made this last weekend for a dinner party and it rocked. I nearly had a panic putting it together because it was really liquid-y but i popped it in the freezer for a bit and then the fridge and it set up perfectly. I will definitely make this again! This is so similar to the recipe my mom used to use – which we’ve lost and keep trying to recreate by searching on line and in books every time we want to make it. Thank you so much for posting this!!! We don’t have to go hunting anymore! Great recipe! I made it for my husband and myself the other night and it is so rich that there was too much for both of us to eat in a couple days. I froze it and we’ve been carving off chunks of frozen mousse and eating it frozen. really good. I’m making these now! Like this very minute!! Thank you so much, Deb! Like several posts before me, let us know where to get those beautiful cups! The coveted cup! Everything you make looks perfectly scrumptious. I link to where you can buy the ramekins in comment 145. I just received an invitation to a chocolate mousse tasting party. I’m making this one. I’ll be sure you let you know you won first prize. This recipe looks fantastic deb! Again, another astounding featXD And congrats on the adorable son! May he know how lucky he is to have you! I made this and it was delicious, but I put it in the refrigerator for a couple hours and it came out too hard. Could I have heated it in the microwave afterwards? It was eaten anyway, and the flavor was great – I just didn’t love the texture and the look. This looks finger-licking good (literally). I just made this mousse and it was hands down the best mousse I’ve ever eaten. Actually, I’ve never liked mousse before tonight, but when I read the ingredients, I thought – maybe I’ve never really been served actual mousse – despite having lived through the 80s. I substituted about 1 1/2 t. of espresso powder and 1 1/2 t. vanilla for the booze and made extra whipped cream with 3-4 t. of brown sugar, a dash of vanilla, and a sprinkling of bittersweet mini chips for topping. In the last couple of weeks I’ve made from your site the classic brownies, chicken meatballs, zucchini almond stir fry (this took 10-15 minutes and was really delicious) and tonight the mousse. Thanks for giving me new ideas. Your photos are beautiful and your writing makes me laugh out loud at the end of long working and baby caring filled days! I’m glad to hear someone else is going old school, because thats how I kick it :). I’m excited to try this, raw eggs, full fat, booze and all! Wow. Amazing mouth-watering photos. I can’t wait to make this! I made this a couple of days ago…my first foray into homemade mousse. DELECTABLE, DELICIOUS, DYNAMITE! Love your blog! I’m writing my term papers and studying for finals right now, and making this mousse was a perfect study break. i’m eating it now and i wanted to thank you for the great recipe! i refuse to cave to the 80s inspired fashion trends people my age are wearing right now, but if all the 80s food is like this then i think that’s ok. I am officially converted and will never again make boring chocolate pudding! For those of you wondering about time, as laura mentioned, it really only takes 20 minutes at the most, including clean-up (I budgeted an hour on Thanksgiving and was thrilled with the extra time). I used 60% dark-chocolate and the result was so rich but wonderfully airy, like a smooth, chocolate cloud of luxuriousness! Thanks for yet another fabulous recipe Deb! oh-so-oldschool! made this for boyfriend’s birthday last night, its his restaurant favorite. i once used Alton Brown’s recipe for our anniversary or something. this one is way better…RIP Gourmet. thanks for sharing!! I know this is an older post, but I just made this and…YUM. Absolutely wonderful. I’m so glad I passed over the so-so desserts at the dessert table this afternoon and waited to come home and make this. Thanks! hi! i just made this and i’m not sure what i did wrong, but it came out too thin. will it thicken in the fridge or should i beat more of something and fold it in again? thanks for any help anyone can provide and thanks for the blog! I have just found your blog and I am archive stalking it and my mouth is literally watering. It’s summer here and I LOVE summer but now I wish it were raining and wintery so I could eat all these things. MOUSSE! I am so making this. Although, when I was a kid (yes, in the 80s) we had a toblerone version that was yummy. I wonder if I can find it again. Now that I’m a grown up and not only allowed into the cooking alcohol cupboard, but stock it much better than my folks ever did. Hubby just asked for creme brulee and chocolate mousse for his birthday weekend. This looks like it will fill half the bill. (Got the creme brulee recipe ready and tested on the Xmas guests, complete with plumber’s blowtorch – it was very good.) Will let you know how wonderful this came out. this is AMAZING!!!! simple, wonderful and stunning! Oh my lands! I’ve had this bookmarked for a while, but had to wait until I’d recovered from the holidays. My 5yo and I made this tonight. He declared it “delicious” and I wholeheartedly agree. Tasted great. But the cream curdled twice for me and on the third try, it peaked, but weakly (has to stop before it curdled again). It did not mix smooth and silky as well, I seem to see some texture in my mousse. Am I doing something wrong? The whipping cream was cold, but not extremely cold. I did chill the mixing bowl. Gawd, I love you for not making me put sugar in this. I am an enormous fan of slightly sweet sweets. question for those that have made this: after the mousse is chilled, is it stable enough to be layered in a cake without having to add in gelatin? It depends on how heavy the cake is but I would play it safe and set it with a little gelatin. thanks! wasn’t sure if anyone was still checking comments – i appreciate it! Here’s the sign of a good recipe for harried cooks: you can miss something important and have it still turn out well. I completely forgot to add the butter (which I didn’t realize until someone said the word butter the next day). My chocolate/yolky mix hardened up some before I could fold in the whites and cream, so I just put it all in the mixer and called it chocolate chocolate chip mousse! It was delicious, and no one knew! This is delicious! I think I overbeat the eggs (I didn’t read until too late that I was supposed to stop at soft peaks) and it still turned out perfect! Thanks so much, I honestly think it has officially subdued my endless chocolate craving! Deb, I have this mousse around five times now and it has never failed me. Thank you so much. :D Also, I was wondering if this mousse could be use as a pie filling to make an improvised Chocolate mousse pie? I made this exactly as written for a big Christmas dinner in Toulouse, France. It got many compliments, and people helped themselves to seconds until it was all gone. I’ve been saving this recipe for a special occasion & today is the day! It’s a small miracle that I haven’t eaten all of it after tasting from the bowl; man oh man is that ever good!!! Thanks! jus made & ate this with friends (a french couple) – they loved it! (and i did too!). thanks! Since I’ve got no hand mixer, turns out pulse on food processor works quite well for the egg white, cream, and yolk as long as you rinse and towel dry in between. And I added rum cuz that’s the only liquor on hand. Thank you so much for this recipe. I was always afraid of making chocolate mousse because it sounded so complicated. Your mousse turned out to be better than the one that I buy at the bakery! I already made it two times; my fiancé LOVES it! I made it for our New Year’s Eve party tomorrow and it turned out fabulously! Since I had bought the chocolate ahead of time I only had 72% cocoa chocolate, but I added a little bit of sugar into the yolks and whites. No electric mixer here either, so I hand whipped all the other ingredients. But I figure it used up some of the calories I will be ingesting. :P One other commenter was very helpful in suggesting you do all the whipping ahead of time and then just assemble once the chocolate has melted. I licked the bowl clean and it will be hard not to get into the chilling desserts… Thanks, Deb! I’ve made this numerous times and never screwed it up, so it’s a winner in my book. :) We’re having friends over tonight for carnitas (you can take the credit for that idea too! ), and for dessert I bastardized this into Mexican chocolate mousse by adding a teaspoon of cinnamon and 1/4 teaspoon of cayenne to the melting chocolate. I also used coffee liqueur instead of Cognac. DELISH! Thinking some cinnamon-agave whipped cream will be perfect on top. Great recipe and post! After searching for chocolate mousse recipes for quite some time, I finally came to your site and picked this one. I’m not sure why I didn’t come here first as your recipes never fail me, and this one was no different. It was so easy! and light! and fluffy! and delicious! I did use Baileys instead of cognac (I don’t like orange/chocolate) and accidentally used semi-sweet instead of bittersweet chocolate. It was still amazing and I will make it many more times! I also took the advice of a commenter and whipped the eggs and cream to almost stiff before starting the chocolate, and then finished them as the chocolate cooled. Made this over the weekend, and it was delicious! I did have a problem though – the chocolate seized completely, despite being warm when I added the yolks – obviously not warm enough. I was a bit nervous about wasting more chocolate so I looked up a few more recipes, and discovered that Jamie Oliver suggests folding the yolks into the whipped cream rather than trying to add them to the chocolate. I did this and it all worked perfectly. Would definitely recommend this method rather than risking adding yolks to chocolate which is either too hot or too cold! I have a question! My mother’s birthday is coming up and she is a SUCKER for a good chocolate mousse. Do you think I could use this mousse in a chocolate mousse cake (I was thinking I would make a chocolate cookie crumb crust and perhaps top the mousse with some chocolate ganache)? Just made this about 10 minutes ago and it is a delicious recipe! I have been looking for the best chocolate musse for a while, and it has been a long and hard journey that has led me here. Some that I have tried have been too thick, too sweet, not sweet enough, too grainy, or too plain. this is the first that I have made that is lighter than air, just sweet enough, silky smooth, and ridiculously easy to make. Fifteen minutes in the kitchen, and I have my reward. And I can only imagine how good it would be with good chocolate (Trader Joes chocolate chips were all I had.) Thank you Deb! Can I make this with white chocolate? I made this tonight. The texture is amazing. I would recommend serving immediately after you make it. It seems heavier after its chilled. Also, next time I make it, I’ll use semisweet chocolate instead of bittersweet. Just made – using parev ‘cream’ and dairy free kosher marge looks divine, on the menu for New Years Eve! A dear friend asked for chocolate mousse for her upcoming birthday,so I googled chocolate mousse, got lots of recipes with coffee in them and no egg whites..finally thought to look here, where I should have started. This is exactly what I wanted. She likes Chambord, so that will be the alcohol. I have eggs from the back yard next door, which need washing in hot water anyway(they seem to keep longer if they’re not washed until used) so I’m not concerned about the rawness. Thank you !!!! I am an american expat living in Paris and I was in charge of making desert for 43 people for Christmas this year. I have never made chocolate mousse (I’m more of a baker), but I know how much French people LOVE chocolate mousse, so I decided to make it. I knew that your recipe would be FABULOUS, and it was. EVERYONE loved it and I felt like I was a professional. The texture was amazing and the taste was wonderful. I felt like a professional — I’ve eaten LOTS of chocolate mousse in the 10 years that I’ve been in France, and this was the BEST EVER !!! Thank you Deb. Keep the wonderful recipes coming. Oh, and I also used this coffee infused semi-sweet chocolate I get in the grocery store here and it tasted amazing. OK first I apologize as my question is not related to this recipe but it’s the closet I could find! I have your divine book and tried the “Chocolate Silk Pie” (page 222) Please, please tell me where and what chocolate wafers you use for the crust. The only ones I could find were the Voortman ones but filled. I assumed (very wrongly) that these were the ones you meant. Big mistake, I ended up with a very gooey, glutinous paste that was so far off from turning into a decent pie crust! So please help and tell me which wafers you used for your splendid crust, or possible substitutes. BTW, just lovin’ the book and cooking up a storm since I bought it. Gail — I used Nabisco chocolate wafers, though they can be hard to find. You can use any plain chocolate cookie. Or, you can make a quick batch of these (no filling) and grind them up. I accidentally just commented on your pudding recipe instead of this one, but I had to still comment on this! For my grandmother’s 86th birthday, I decided I wanted to make pecan baskets with chocolate mousse topped with whipped cream and fresh raspberries. After reading at least 10 different chocolate mousse recipes, I stumbled upon yours, and I had to come comment that everyone told me it was THE BEST dessert I have every made. And ALL thanks to you! (Also, I had to substitute orange liqueur because it was all I had on hand). Now, I cannot stop reading all of your recipes, and I have to get my hands on your cookbook this week! Thank you for your incredible recipe!! I will be making this time after time!! Thank you!! Just as I had remembered it! Folded in chocolate curls and subbed Kahlua instead of brandy so yummy! If I wanted to make a layered mousse dessert, could I use the same recipe and substitute white chocolate for the chocolate to make a white chocolate layer? What do you thinK? Thank you! Thank you. I needed to make sure I didn’t slip a disk in the brain. This is getting layered with Hazelnut liqueur soaked genoisse, whip cream and raspberries. The 15 second microwave tip is an easy one to miss. Going long just a little makes chocolate challenging. I first stumbled on this more than a year ago, and it’s become a much-requested treat. Tomorrow night we will have it as the ending of our Valentine’s Day dinner for four, and the following week it will appear at a friend’s Sunday lunch. I made this for my boyfriend for Valentine’s Day. He has asked for it about every three days since. Enough said. Every time I make this and read the headnotes on the recipe, I want to kiss you. You are awesome. Mousse is awesome. Hm. Warm I suppose can mean different things but here we just need it to not be so hot that it would liquefy whipped cream. Were you able to get good volume from the egg whites, whipped cream and get a “ribbon” from the egg yolks (i.e. a thickened batter) and it all just fell apart when you put it together? My housemate just said “I want to learn to make chocolate mousse,” so naturally I came to Smitten Kitchen. This is perfect. 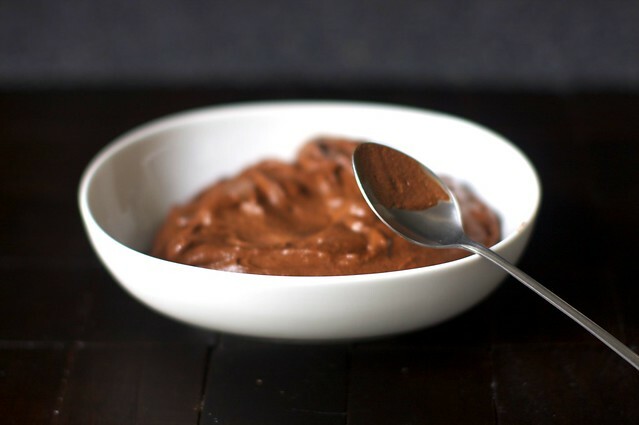 I finally made this…I’ve always thought mousse was a bit intimidating but it turns out it’s incredibly easy. This recipe is so delicious – thank you! Just made it. It is really good! I made this for my boyfriend for Valentine’s Day and he just loved it! The only change I made was adding cabernet sauvignon instead of the Cognac. Oh, and I forgot the salt. This was so light, fluffy, and decadent. Thank you for the recipe! After comparing many chocolate mousse recipes, I decided to go with yours and was not disappointed! This was my first time making chocolate mousse, so I followed the instructions carefully and it came out perfectly. The balance of flavors was perfect and it was very fast and easy to make. Definitely making this recipe again. Warm thanks for sharing it! Someone may have made this comment already, but this mousse recipe reminds of my great-aunt’s eggnog recipe — and there, our family-held belief has always been that if you add booze to raw eggs, you’re effectively “cooking” the eggs. (I don’t know if this holds any real truth, but it makes me feel more confident in slingin’ back the eggnog.) Perhaps the same is true here, esp. if you combine booze and eggs before adding to the chocolate concoction. Thanks for another super recipe! I was tasked with making vegan chocolate mousse for easter dessert. It was a huge failure that looked like a chocolate soup of sorts. For the rest of the crew I made your mousse and it was amazing (as usual) and your comment about being about to sub things about but it no longer being chocolate mousse made me so happy because that’s how I felt while I was making the accidentally chocolate soup. Was it the famous Hervé This’ Chocolate Mousse with just water and chocolate? Been wanting to try it but nervous. I make vegan mousse. Sometimes I make it firmer with a little extra sunspire chocolate chips and make a graham cracker crust for a classic vegan take on chocolate cream pie. There’s plenty of recipes out there. Look for one with extra firm tofu in aseptic packaging. I have fooled many an omnivore with tofu creamy desserts. Made this for a dinner party this past weekend. Oh My God, so fabulous. Exactly what I wanted. I’ll be making this dessert often in the future. Perfect. I am currently 9 months pregnant and have been craving chocolate mousse since month 2. I am very excited to try this particular recipe once my little man finally evacuates. Pasteurized eggs are the answer to the raw egg dilemma! They are available where I am and I have used them before in various raw egg recipes. Had all of the features, texture, flavor, and, did I say texture(?) that I remember from mousse from some finer dining establishments. Are you sure the whipped cream is supposed to go into the mousse? I got to this step and everything liquified. I think I’ll go back to Julia Child . . . . . . . I make this using this recipe about twice a year. It is amazing, fantastic, and wonderful, and my family begs me to make it! I do cheat a bit and let my Kitchen Aid beat the cream as I beat the yolks, but it just makes it that much easier and quicker for this beautiful creation to come together. Thanks so much for this perfect recipe! Deb, I’ve been looking for a great chocolate mousse recipe ever since I lost the Knox gelatin packet with their recipe for cm on it-which I loved. Your’s sounds wonderful and I’m going to make it for my niece who’s returning next week from working on a primate preserve in South Africa. She loves cm as much as I do! I was surprised that this recipe had no sugar at all – not even a few tablespoons considering the 60% bittersweet. Most other traditional recipes, call for sugar. I was wondering if this was a misprint? I just made this and it definitely needs a bit but I’ll make some sweet fresh whipped cream and that should suffice. I do love all your recipes and have made many of them! Oh boy, I messed this up. If I try it again, I’ll beat the yolks before I melt the chocolate. I think by the time I whisked the yolks into the melted chocolate it was already too cool. I just poured a bowl of lumpy, curdled chocolate down the sink. I don’t think I’ve ever made chocolate mousse before, but decided I wanted it for my 30th anniversary today. Fortunately, I had some beautiful eggs from our church CSA. Easy recipe with great directions. It turned out perfectly! This recipe did not work for me. After adding the chocolate mixture to the well beaten yolks, I wasn’t sure how long to mix it- but after about 20 seconds or so, I saw the mixture get thick and paler in color. I waited until it came to room temp and attempted to gently fold in my stiff heavy cream and soft peaked egg whites. The mixture never became homogeneous, I ended up with chunks of chocolate and did not get the light airy texture of a mousse. Any idea on what happened? How long do you mix your chocolate after adding it to the yolks? Thanks in advance..
You can skip it! It’s just for nuance. And thank you! Can you sub with cocoa powder? What happens is you use more than 60% chocolate?